Who loves beautiful arched mirrors? Cool mirrors? A Gothic mirror perhaps? I DO! 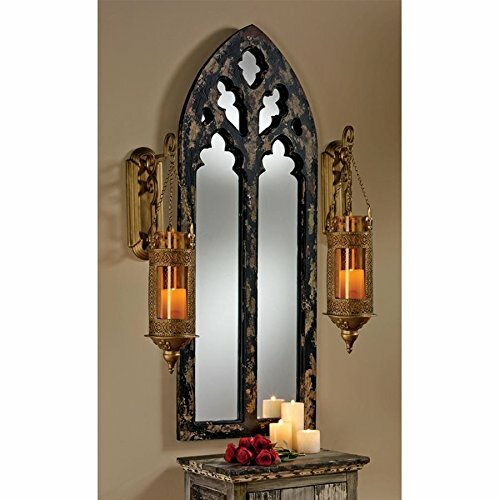 This cathedral arched Gothic mirror has got the perfect look for your Gothic bedroom, bathroom, and actually anywhere in your awesome house. Just look at the stunning weathered look and how those cool hanging lanterns add to the vibe! I wish they were included. But their absence doesn’t detract from the Gothic mirror before you! This hand-finished wooden frame is just oozing with style and will be the envy of many of all your evil acquaintances. You could use it in your bathroom or even as a center piece at the end of a hallway… that would look super creepy for sure! All you need is a couple of twins on bikes riding up behind you and… BOOM! Time to buy a new Gothic mirror. Pick up this wonderfully weathered Gothic mirror and live Gothic today!